Located at a short distance of 900 m from Chapora beach, this is an offering of a two-bedroom, fully-furnished apartment which can accommodate up to six people. The accommodation houses a fully equipped kitchen, with an in-house chef to cater to your food requirements. 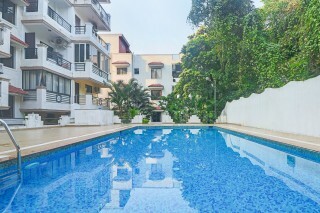 The property has a shared swimming pool which can be used by the guests. 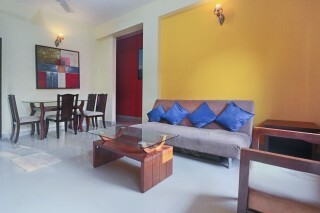 Your Space Located in a gated residential colony, the apartment on offer flaunts bright yellow walls in the living room. Furnished with a comfortable two-seat settee and a coffee table where you can sit and enjoy your favourite book, the living area opens up to a balcony from where you get a beautiful view of the lush green surroundings. 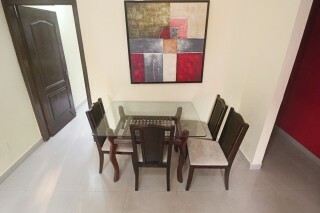 The dining space houses a four-seat dining table for convenient dining purposes. The apartment is equipped with modern amenities such as a refrigerator, air conditioner, and a television for leisure viewing purpose. The two rooms on offer are modestly furnished with wooden double beds and wooden cupboards for storage. There is a fully-functional bathroom with modern sanitary-ware. 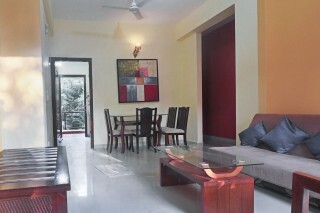 "Excellent location - short walk from Chapora beach"
My wife booked this property for five days and six nights. 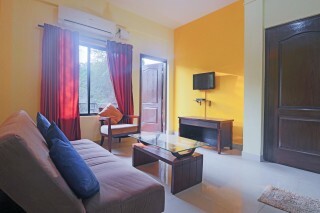 We went to Goa with our parents and really wanted a place which would feel more like a home. Unlike hotel rooms which are far apart, this apartment was perfection. The locality was decent and quite easy to fine. The place was just like what was shown in the photos. We also enjoyed the swimming pool. It was clean and a relief on hot days. The apartment was itself very modern and very stylish. The furniture was very modern too. It was clean. The rooms were clean and the beds and pillows were soft. The person looking after the place was attentive and gave a great tips and ideas regarding the places we should visit. And of course the beach was superrrr close to out apartment. The area was just lovely. I would love to stay here again the next time I come to Goa. The place was located very close to the Vagator beach and Chapora fort. It was a gated building with a nice swimming pool. 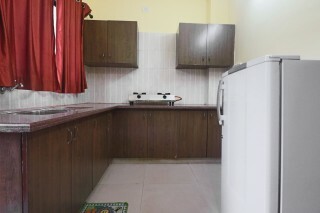 The 2bhk was nice and well made and was kept clean and ready. However, the kitchen didn't have a working stove with basic utensils (we could make Maggi late night). There were towels and blankets. But toiletries were missing so we informed the care taker and got them. The TV set top box wasn't working and we had to ask the care taker to recharge it. Also, there was no WiFi (and that was a problem because network connectivity wasn't great in this area). Otherwise, a pretty affordable and no-frills stay totally in budget. A little more guest-interaction would be better during the stay. Location of the place was very convenient. Having access to Vagator, a few cafes and restaurants and the car rentals near by. The apartment met all the expectations infrastructure wise and the House manager Mr. Rambau helped quite a lot in figuring out the basics. But no Wifi, pool access till only 7 and water, electricity cut all night, were a major disappointment. Make sure about all the facilities before taking this place. it really nice place to stay. best location to nearby clubs such as Waters ,Dali bar ect. near to vagator beach. Good place for food near by. Property is good. Very much friendly staff. Suitable for family. Room was clean and pool is also a good. Parking is bit small but manageable . Very good. Very Very good. Very good. Very good. Very good. Very good. Very good. Very good. Very good. Very good. Very good. Very good. Good stay. Good location. Clean apartment. Good amenities. Good room service. Overall, a great experience with friends.